Stepinski created the new world map to better understand the migration patterns across the globe, especially why people leaving Guatemala and Honduras to reach the United States. He used high-resolution satellite images from the European Space Agency and turned them into one of the most detailed looks so far at how people are reshaping the planet. 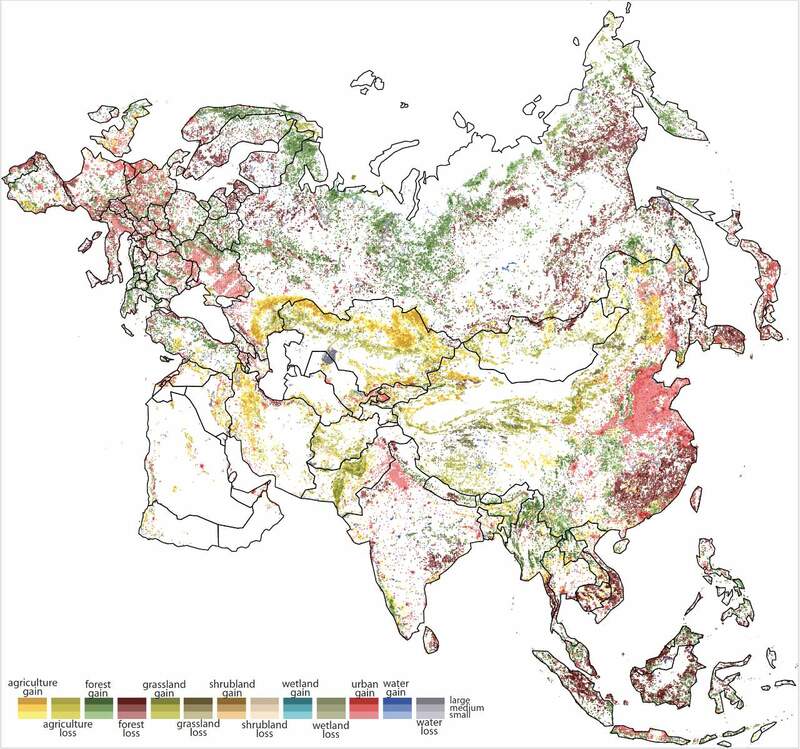 The colorful charts, published on November 15, 2015, on the UC News webpage show the changes in forests, urban areas, agricultural land and wetlands, water gain and loss, and more. The map packaged up into 9-kilometer by 9-kilometer (5.6-mile by 5.6 mile) squares (81 km2 or 31.36 sq mi). Those squares were then color-coded to produce the maps. Darker shades indicate the highest rate of change in each category. He adds: “We already knew about deforestation or wetland loss or increasing urbanization. But now we can see exactly where all of that is happening”. Since 1992, the European Space Agency is capturing satellite images of the Earth to study climate change. The surface cover can dramatically influence the global temperature depending on whether it absorbs or reflects sunlight. Likewise, forest cover absorbs way more carbon dioxide than the urban areas. “The great achievement for the European Space Agency was to make sure the satellite images were compatible from year to year so you could compare them,” Stepinski says. He also adds the map shows how finite natural resources are being exploited on a global scale, an at an incredible pace: “What makes this so depressing is that it’s examining a timescale that is shorter than our lifetime”.